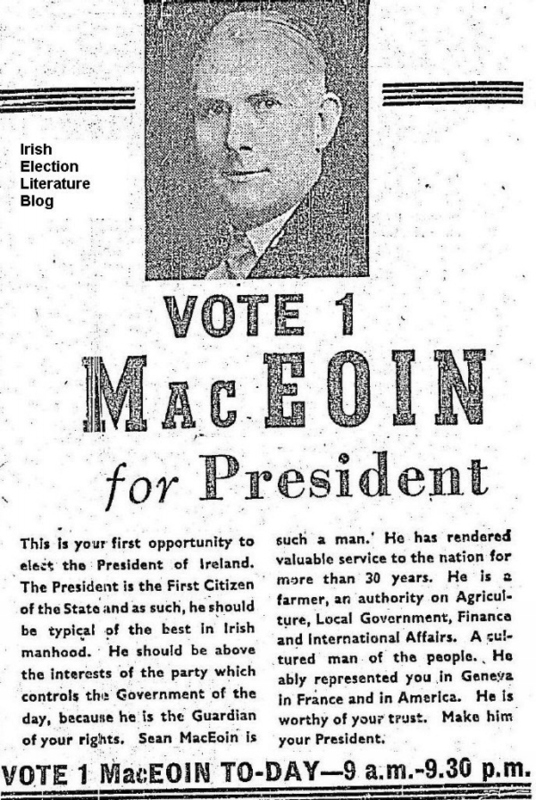 From our first Presidential Election in 1945 an ad for Fine Gael candidate General Sean MacEoin. MacEoin polled 335,539 votes in a contest won by Fianna Fails Sean T O’Kelly. A veteran of the War of Independence, the Longford native was first elected to the Dail in 1929. Might be relevant to 2011 campaign to have a look at MacEoin’s 1920 bye-election literature in Sligo/Leitrim and his 1932 literature in Longford/Wesmeath. For the Fine Gael machine then, too in 1929 and 1932 – Fianna Fail were’ ”communists” and ”devils.” Fine Gael always had a boogie-man in hiding……. MacEoin tried again in 1959 for the Presidency. Ireland will never give ti to that party – they executed the father of one future President and they forced another to resign – directly attacking thew Commander in Chief of the Army in front f an audience of Army officers. When MacEoin first became a Minister his party leader was not Taoiseach, due directly to his conduct as Minister for Defence in 1920s, when 77 persons were executed without trial by the first Fine Gael Government. MaEoin himself was unrepetant where these incidents occurred under his team – Sligo, Athlone etc. MacEoin was also reputedly a Knight…a not insubstantial factor in the Mother and Child controversy which engulfed that first intertparty government. You wouldn’t happen to have copies of “MacEoin’s 1920 bye-election literature in Sligo/Leitrim and his 1932 literature in Longford/Wesmeath.” ? I’d be familiar with the Cumann na nGaedhael material of the 1932 election where a lot of it is all about Fianna Fail and its armed past, similar as you say to the current Fine Gael (and others) reaction to McGuinness. It’s easy to sit behind a keyboard and make all kinds of allegations about the man. It would be more proper to balance the comments with other facts about Sean MacEoin like how he left a lucrative family business to risk his life to fight for the freedom of our country, how he lead attacks and ambushes on the British forces, how he was captured, shot and beaten by the British forces in Mullingar, how he was sentenced to death and was the only prisoner the British government did not want to release at the time of the truce. To think that he has been accused of being a knight is simply ludicrous. Isn’t it time to move on from civil war politics. Other countries have moved on from two much more terrible world wars. Why can’t we do the same? The by-election being referred to is probably the 1929 Leitrim/Sligo poll where MacEoin topped the poll for Cumann na nGaedheal.